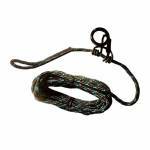 Defend yourself from serious injury or even death while hunting at heights with the G-TAC Fall Defense Line quick-connect tree rope. Connect on the ground and slide while you climb! 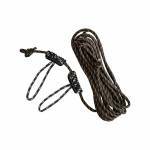 Includes 30-foot, weather resistant reflective rope, rubber coated o-ring and self-locking carabiner, for hassle-free and silent, harness connection. Rated for up to 400 lbs. Prusik Knot Includes a Silent Coated O-Ring and a Self-Locking Carabiner Harness Connection Construction 30’ of Weather-Resistant Braided ..
A Unique System that Allows the User to Stay Attached to the Tree at all Times Two Prusik Knots; Slides Easily Up and Down the Rope During Ascent and Decent and Stops You IMMEDIATELY Should a Fall Occur Prusik Knots made of Reflective Material that Enhance Daytime and Low-Light Visibility CONSTRUCTION: Braided Nylon; USE: Stay Safe from the Moment You Leave the Ground to the Time You Return! ; Length: 30’; WEIGHT RATING: 300 Lbs. 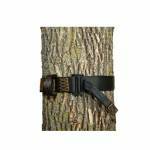 ..
Strap this harness tree strap to the tree just above your stand. When you get in the stand, click in your safety harness and the tree will keep you from falling. Get 1 for each stand location and always click in when you get in the stand. CONSTRUCTION: Steel Buckle; Stitched Nylon Belt LOOP: Extra Thick, Double Stitched SIZE: One Size Fits Most WEIGHT RATING: 300 lbs. 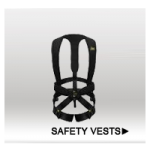 1 tree strap, harness not included. ..